Surfing has become one of the most amazing and followed sports in the Costa Rica adventure travel department. If you are into heavy- exciting sporting events, surf is your way to go, especially because there are plenty of teachers in the country that will love to help you out. During your family adventure package, you can learn how to surf and maybe have a close encounter with a nice wave in this natural paradise. Costa Rica is highlighted by the World Surfing association as one of the best Central America spots to surf with amazing surfers all across the nation. Actually, for the tourists, surfing becomes as one great opportunity to meet these great athletes, basically because most of them have their own Surf School to teach foreigners. So, if you are looking for some exciting Costa Rica family surf vacations, this is your destination. If you are planning on having your family holidays to learn how to surf, the Pacific might be your best option. The Pacific beaches have smaller waves and it is easier to learn because is not dangerous to get hit by a strong waves or by the surf board as well, in the Central and North Pacific is where most of the surf schools are concentrated. Also is important to consider that if you do not speak Spanish, your Costa Rica travel guide will help you find some nice surf lessons for you to start riding the board and having the time of your life, while you enjoy the prettiest beaches in Costa Rica; plus the rest of the amazing landscapes and the great sympathy locals have. You can go surfing during your family surf vacations, at Boca Barranca, Playa Escondida, or at Playa Dominical but if you want another market perhaps, and you want a beach that combines every luxury that you might think, with great waves, Playa Jacó and Hermosa can be some of the best choices. However if you are an experience surfer and despite we can assure, you will enjoy the Pacific Costa Rica beaches, your place might be better at the Caribbean, as the waves are stronger and more dangerous; the swell hits the Caribbean more on a regular daily basis helping it to have better and tremendous waves to surf on your vacation packages. In fact, at the Caribbean side, the south part, specifically in Puerto Viejo Costa Rica from Limón, you can find one of the best surfing beaches in Costa Rica, where the best wave of Costa Rica and Central America is located, and it is certainly only for experience surfers, it is called Salsa Brava. Beautiful but technical and dangerous. Salsa Brava – Puerto Viejo Beach, at 5 hours approximately, driving from San José the capital city, is Puerto Viejo located, a small downtown with a big cultural richness, home of the Afro Caribbean culture and the place where you should go to experience the most amazing wave, Salsa Brava. Witch’s Rock Beach, it is located on the North Pacific, in Guanacaste Costa Rica province. It is a less touristy place, not very visited as the waves are stronger and taller, perfect for surfers and not up to families with children, it is a nice scenery to practice surf during your vacation packages. Dominical Beach, in the South Pacific of Costa Rica, is Dominical beach located, not a developed area, with virgin forest in the surroundings and known for its strong and fast waves, a good spot for your Costa Rica surf vacations. Pavones Beach, it is also a secluded beach, located in the South Pacific. The problem with this spot is the weather, more unpredictable than the rest of the country, it is a humid place but if you find a good weather when you are on your Costa Rica vacation package, it could be your best spot for surfing. Where to find the best surf camps in Costa Rica? Tamarindo in Guanacaste, and Jacó in Puntarenas province, are two of the best options, as these are surf spots and touristy areas, is easier to find surf camps in these areas and great Costa Rica hotels to spend your holidays. 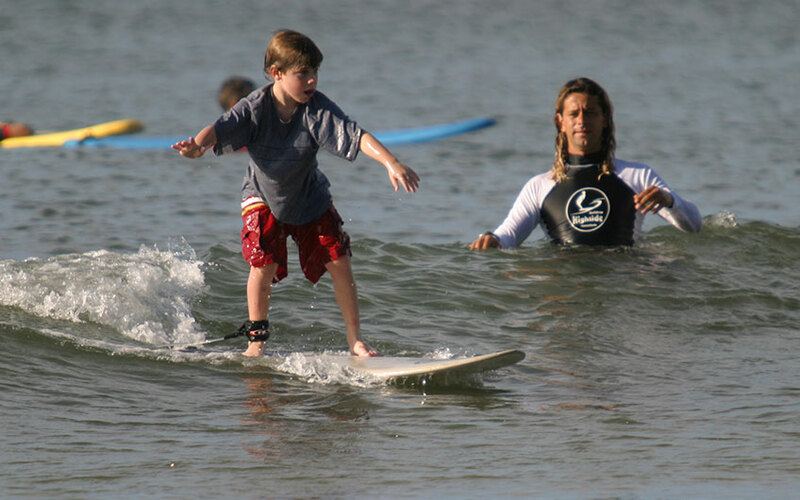 Depending on your desires, we can find something that adjust to your family surf camp Costa Rica. If you require more details about Costa Rica surf vacations, please do not hesitate in contact us, our travel experts are waiting to hear from you! Please also, leave us a comment about this article if you liked it!